Welcome to the 2015 Poetry Reading Challenge! 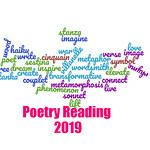 No need to sign up or set a goal, other than to read at least 1 book of poetry or 20 poems this year (these can be by different poets if you choose). If you share a review or a post about poetry on your blog this year, link it up below! Here’s to another great year in poetry! Hi, Will you be doing this challenge in 2016? I’ve loved doing this one. I just signed up and plan to read some poems each day. I do not blog but plan to use Goodreads to track my progress. Would a novel in verse count as a book of poetry? Yes, it will! Very low-key this year. I haven’t even made any goals for myself this year, other than on GoodReads.